Spoke with Janet on several occasions and discussed my needs etc. Janet is extremely knowledgeable of the products that Slivers Mill sells. She is always helpful on the phone and offers solutions to any situation toy may need. Slivers Mill & Janet are a customer oriented company and a real pleasure to do business with! Janet keep up the GREAT service! Perfect for Cutting Finger Joints, Rabbets and Grooves! Precision cutting for fine joinery. Create quality finger or box joints for jointing two pieces of wood at right angles. Excellent for cutting rabbets (grooves). Great for doors, casement windows, window frames, accommodating panels in furniture construction and other woodworking applications. Can also be used for grooving plastics. Solid performance. 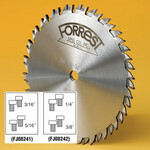 Like all Forrest blades, the 2-Piece & 4-Piece Finger Joint Sets have high-grade carbide tips and are hand straightened. Exceptional perimeter concentricity produces a flat bottom groove. Long life. The propietary grinding techniques Forrest employs produce blades that last up to 300% longer between sharpenings. Affordable, state-of-the-art, in-factory sharpening services are available when needed. For craftsmen who want the best! These are the only American-made, high quality finger joints sets on the market today. Ideal for fine woodworking applications and professional shops. Choose the Customized Woodworker II with the #1 Grind for cutting flat bottom grooves, finger joints, tenons, or a dedicated rip. 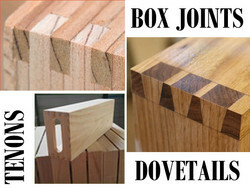 For Dovetails, choose your angle and left or right tilt with the Custom Woodworker II Dovetail blade. 4-Piece Finger Joint sets include FREE Bladerunner Carrying Case. Get both 3/16" & 5/16" and 1/4" & 3/8" sets for one Great Price of only $242.75! Receive THREE $5.00 Sharpening Coupons with purchase plus FREE Shipping. Other bores up to 1-1/4" per 4 pc. set only $44.00 extra.